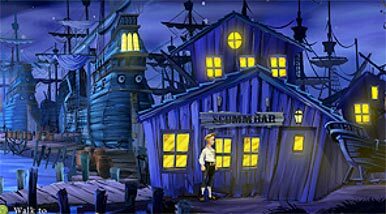 On Wednesday at the GDC, LucasArts unveiled its plans for The Secret of Monkey Island: Special Edition. The game will be distributed for the Mac by Aspyr, and sold through the GameAgent online store for $10. The Special Edition includes two versions of the game. The first version is the original game released in 1990. The second version is what an Aspyr representative called an “enhanced” version of the original, with redrawn art and new voice acting. The Secret of Monkey Island: Special Edition is for Intel Macs only and requires OS 10.5 (Leopard) or 10.6 (Snow Leopard). Aspyr says that Macs with integrated Intel graphics are not supported.